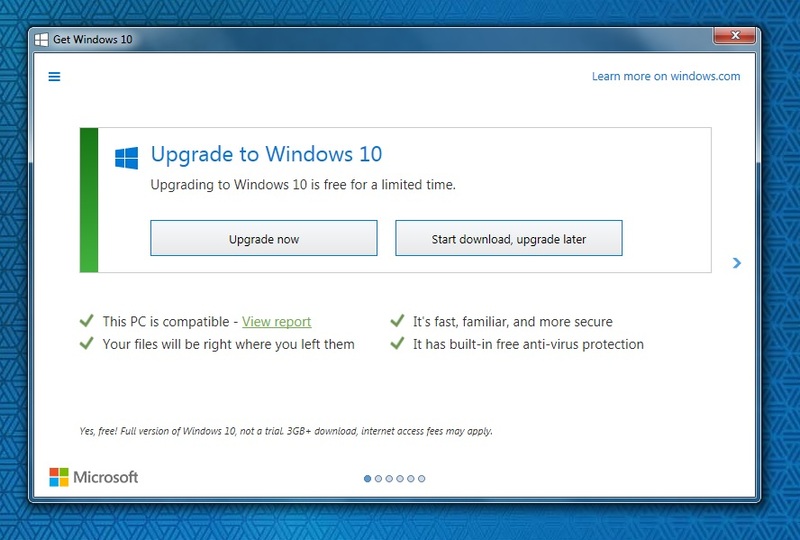 Recovering from an unintentional "Upgrade"
How many people did Microsoft inconvenience (or worse) before changing their message? Last week, after months of getting a little flag next to the icon that appeared on my taskbar last summer,"Get Windows 10" started popping up in the middle of my screen, already open, when I logged on. Later' maybe they'll leave me alone." So I clicked it - and the download started, tying up my laptop for hours. Worst of all, when I finally was operating in Windows 10 my ACT! program, that I have used for years for scheduling and contact management, didn't work. 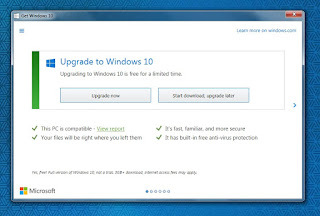 A couple of days later they changed the options on the pop-up to "Upgrade now" and "Start download, upgrade later" as on the image above. That certainly is more helpful, and would have prevented me from clicking on EITHER. I didn't click to download, I did so to get them to leave me alone. Well, I finally found out how to revert to Windows 7 (you have 30 days to do it after you "upgrade") and now I can again use ACT and enjoy my familiar "desktop." A Concert to make an emcee smile! I will really enjoy being the "Master of" this "Ceremony!" This year's Holiday Pops returns to Brockton High School and promises to be spectacular and fun. Hope to see you there this Sunday! Publicity like this is a great assist in filling the auditorium at Brockton High School. Thank you! 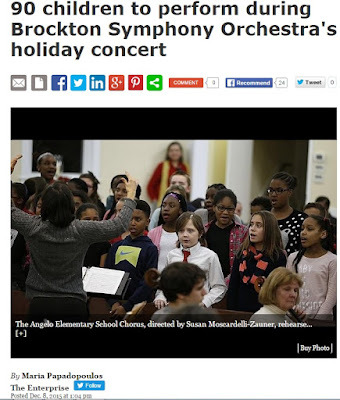 BROCKTON – The voices of 90 Brockton children will sing Rudolf the Red Nosed Reindeer during the Brockton Symphony Orchestra’s annual Holiday Pops Concert on Sunday. The Angelo Elementary School Chorus, under the direction of Susan Moscardelli-Zauner, will perform the classic holiday song during the 3 p.m. concert in the auditorium of Brockton High School, 470 Forest Ave. The annual concert draws hundreds of people each year. Last year’s concert saw about 600 attendees, said Emilian Badea, who will conduct the holiday concert. Four musicians from Brockton High – playing the violin, flute, and cello – will join the 40-plus member orchestra, he said. “It’s a good chance to promote youngsters and give them the experience to sit in a symphony setting,” Badea said. The audience will be invited to sing along to “A Christmas Festival” by Leroy Anderson, organizers said. Badea said local residents should take advantage of having a symphony Brockton. “You have a symphony orchestra in your city. You don’t have to travel to Boston or other cities. It’s a good time,” he said. Parents can bring their children aged 18 and younger to the concert for free. “We are looking to spread the goodness of music and goodness of people through our music,” Badea said. Tickets are $25 for adults, $20 for seniors and students and free for people 18 and younger. Tickets may be purchased online at www.brocktonsymphony.org, by calling 508-588-3841 or at the door.